HIGHLAND PARK, LOS ANGELES (KABC) — Authorities say an 87-year-old driver blew through a stop sign, slamming into a family of five walking in a crosswalk in Highland Park Friday. The accident involving a Dodge Durango happened in the 900 block of N. Avenue 57 near Yorkdale Elementary School at 8:12 a.m. The victims were treated at the scene and then rushed to a local hospital, a Los Angeles Fire Department spokesman said. The driver immediately pulled over after the accident and was being questioned by officers. LAFD officials say he did not appear to be impaired. 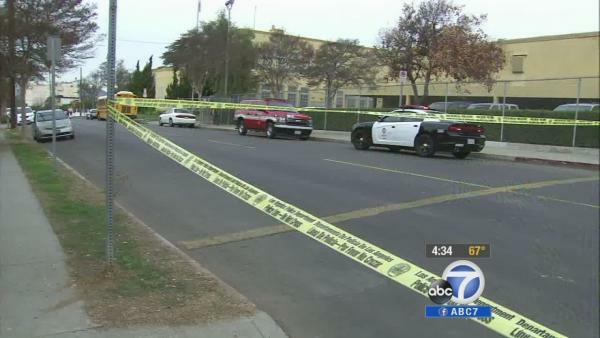 According to the Los Angeles Unified School District, the victims include a third-grade boy, two fifth-grade girls, a mother and the children’s 55-year-old grandmother. The mother told officials that two of the children were her own, and the third was a cousin. The grandmother, who is in her 50s, and a 7-year-old girl are in critical condition. Officials say the mother, in her 30s, and two other children, both age 10, suffered non-life-threatening injuries. It’s unclear if the driver will face any charges.